All gear laid out, mandatory gear on left, "optional' gear on right. Actual running kit w/ trekking poles not included. Ever since my company Haufe agreed to sponsor my participation in this amazing once in a lifetime adventure nearly 10 months ago, I started the logistical planning process. The Everest Trail Race in the Himalayas of Nepal in the Solukhumbu region. The altitude generally ranges between 6,600ft and 13,500ft. The race course is broken up into 6 individual stages, covering a total distance of just over 100 miles with a change in elevation of nearly 100,000ft. Temperatures can range from the upper 70s during the day to well below freezing during the night, which requires a wide range of available clothing options. Since this race is largely self-sufficient, runners must carry all the gear necessary (except for water, food and tents) to run and survive 6 days in the Himalayas. 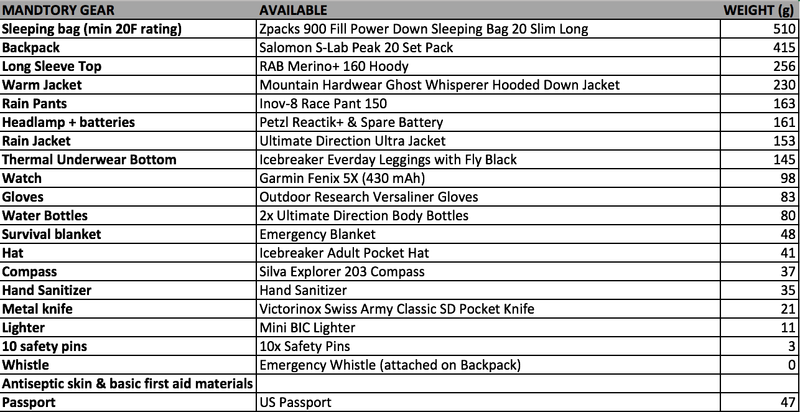 Mandatory gear list for Everest Trail Race. The weather conditions and duration of the event require participants to not only carry mandatory gear, but also other gear that while not mandatory really should be considered required gear. Of course, opinions and needs vary widely, which explains why I have spent the better part of the last 9 months in buying gear, exchanging gear, adding and removing gear from the lists and why I am still not done. Is my sleeping bag warm enough? Is it to heavy? What kind of clothes will I need/want in camp? How will I keep essential ear dry inside my back? Will the pack work? Do I choose wool over synthetic? You get the idea, questions upon questions upon questions, and I'm still changing things. Mandatory gear laid out prior to test packing. As I enter the final days of race prep, it was time to actually lay out all gear and try to fit it all inside a 20l running pack. While I had some of the gear in my closet already, the special nature of the event required some purchases to allow the best possible outcome during this stage race. 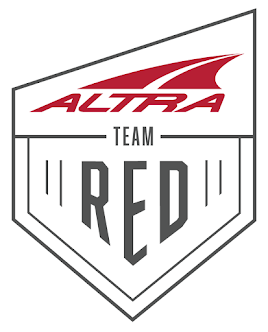 While regular tech shirts certainly work great during a single day race, wearing the same shirt for 6 days straight raises some concerns that may be better addressed by clothing that consists mostly of merino wool fibers. 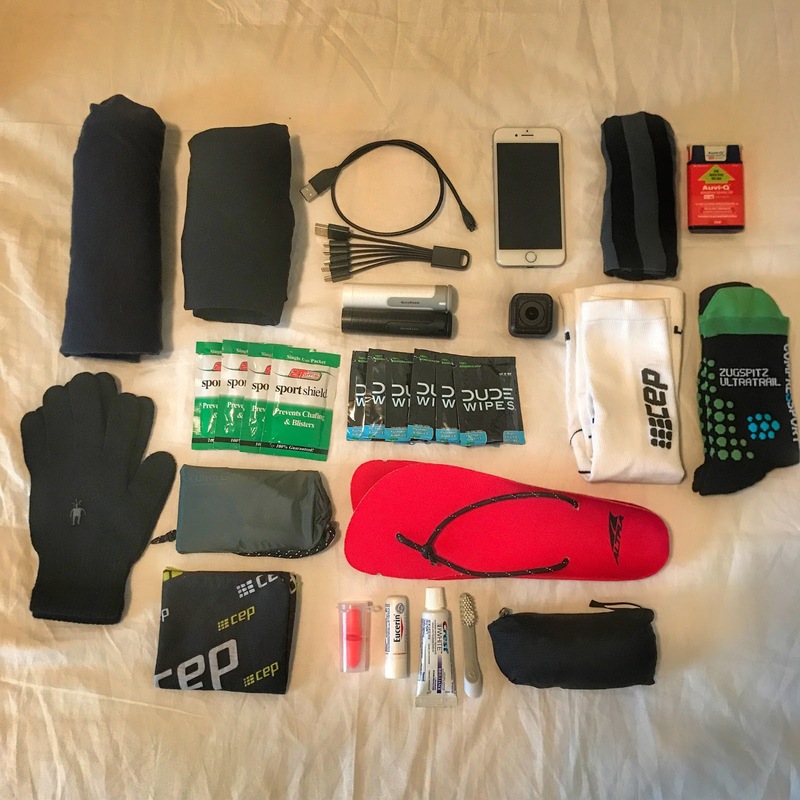 In addition, the weight of gear plays a major role when having to carry all of your gear during a 6 day race. 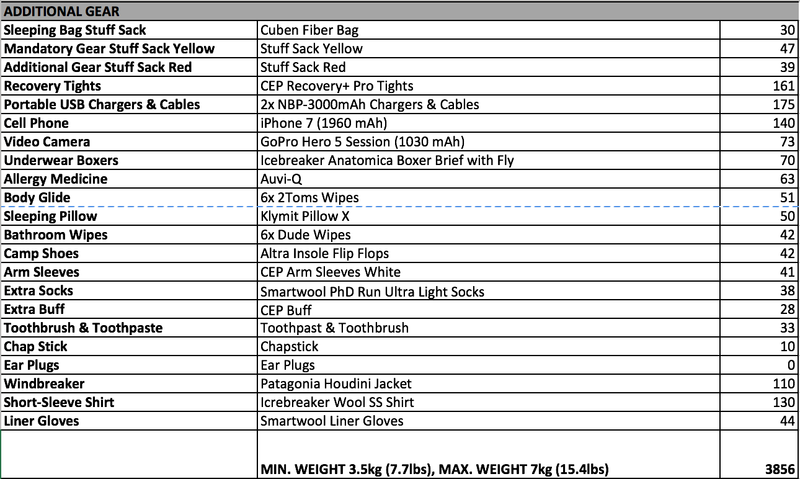 Optional gear list for Everest Trail Race. The lists and images in this post reflect the logistical planning of the last 9 months. I plan to test out some if not all of this gear during some acclimation training as well as a last training cycle to try to replicate the conditions on race day, both in regards to weather and terrain. Hopefully, meticulous gear planning coupled with altitude acclimation and terrain specific training will put me in a position to complete this event with as little problems as possible. My goal is to have the experience of a lifetime with as few mid-race disasters as possible. I do plan to push my own pace within my limits (after all, I am quite competitive by nature), but my main goal is to stop and smell the roses and to take some pictures and videos to last lifetime while moving through what will be the most memorable terrain I will ever encounter. Option gear laid out prior to test packing. There actually is a minimum weight requirement for gear of 3.5kg or 7.7lbs and a maximum gear weight of 7kg or 15.5lbs. I was able to keep total gear and pack weight to just 3.8kg or 8.5lbs. Hopefully, my gear planning phase is in its final stages and I can focus on a bit more training in the last weeks leading up to race day. Mandatory and optional gear packed. 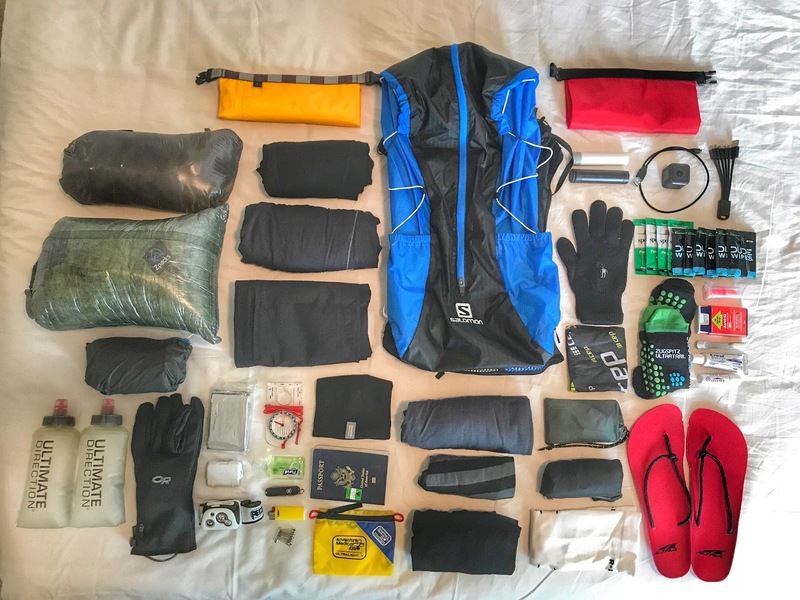 UPDATE: After arriving in Kathmandu, Nepal and before the actual gear check through the race organizers, I had made some final adjustments to my gear list. First, I upgraded my sleeping bag the Zpacks 900 Fill Power Down Sleeping Bag 5F Standard Long (700g) after receiving a last minute report from the race organization that temperatures were exceptionally low, potentially dipping as low as -10 Celsius (15 Fahrenheit). Warmth and comfort at night easily outweighted the weight savings of a smaller/lighter bag. Either way, this sleeping bag was still extremely lightweight. I has also made some other small changes related to toilet paper (I took a combination of tissue and wet wipes). I also replaces individual anti chafing wipes with a stick for weight savings. Finally, i swapped the mandatory compass for a much smaller version. My pack ended up weighing in at 9.2 lbs (4.2 kg) during the mandatory gear check and that included everything listed above. 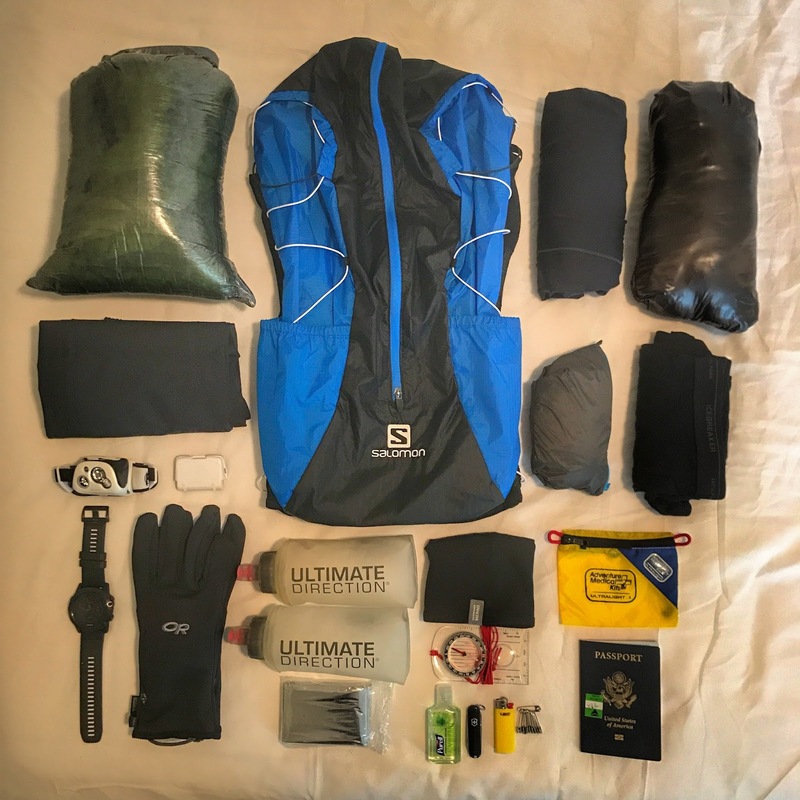 I did ue almost everything I packed, but I could have saved a little bit more weight by only taking one pair of tights (either compression or long underwear), removing the pair of boxers and the extra short sleeve shirt. The pillow was not a necessity and I had also removed the EPIpen prior to gear check. All in all, I could have come in just above the minimum required weight of 3.5 kg, but either way, I am very happy with my overall gear choices. I may not have used my windbreaker, but I was sure glad I had it just in case.